by Chris Woodford. Last updated: August 23, 2018. A column of platinum the size of a man is about 25 times heavier (it weighs an amazing 2000kg or 4,400lb)! Platinum is a dense, expensive, and relatively rare, silvery-white metal—and those may be the only things you know about it. The name "platinum", which comes from the Spanish word platina (meaning "little silver"), relates to when and where the metal was discovered (in Latin America in the early 18th century). Platinum is a relatively recent human discovery compared to such age-old metals as iron and copper, but it's rapidly found important uses. You probably know that it's the magic ingredient in pollution-busting catalytic converters that help to keep our streets free of traffic fumes, but it's also used in dental fillings, scientific equipment, and jewelry. Photo: Rich pickings: The Kondyor Massif in Eastern Siberia, Russia is a natural ridge about 10km (6 miles) across packed full of minerals, including platinum. Photo by courtesy of NASA Jet Propulsion Laboratory (NASA-JPL). Which countries produce the world's platinum? Chart shows estimated figures for 2016 (outer ring, white labels) and 2017 (inner ring, black labels). Source: U.S. Geological Survey, Mineral Commodity Summaries, January 2018. It's not something you stumble across every day. Platinum is the 72nd most common chemical element in Earth's crust—and, given that there are only 94 natural elements anyway, that makes it pretty rare. That's largely why platinum is so expensive. Currently (2018) it costs around $30,000 or £20,000 per kilogram (which is about $14,000 or £10,000 per pound)—the lowest it's been for about a decade. So the adult-sized block we spoke about earlier would set you back a cool $60 million or so. You can find platinum (atomic number 78) buried deep in the middle of the periodic table in group VII among elements collectively known as the transition metals. Its near neighbors include iridium, osmium, palladium, rhodium, and ruthenium—five metals which, with platinum, are often called the platinum group metals (PGMs). They're well known for their catalytic properties: they help to speed up chemical reactions without themselves changing in the process. Platinum's catalytic properties have been known since the 1820s, when they were first discovered by German chemist Johann Wolfgang Döbereiner (1780–1849). Although platinum earned its name only in the 18th century, the platinum metals (and alloys rich in platinum) were known in ancient times. Platinum is thought to have been described for the first time in 1557 by Italian chemist Julius Scaliger (1484–1558), though it was found in large quantities only in 1750 when Spaniards mining for silver in Rio Pinto, Colombia discovered it as an impurity and named it "little silver" (it's also sometimes called "white gold"). Unlike many elements, platinum can be found in its pure metallic form in nuggets, alloyed with other platinum metals, or as part of a mineral ore called sperrylite (platinum arsenide). 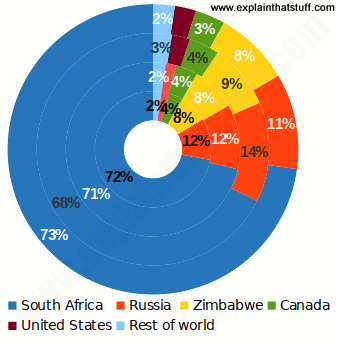 It's located and mined all over the world, although the biggest producers (in order) are South Africa (where most platinum comes from), Russia, Canada, and Zimbabwe (see the chart alongside). The United States is currently the world's fifth leading platinum producer, with two dedicated platinum mines in south-central Montana (Stillwater and East Boulder); some platinum is also made as a byproduct of copper refining in mines in Texas and Utah. According to the US Geological Survey, the United States produces over six times as much PGMs by recycling new and old scrap (some 110,000kg) as it does from these mines (16,900kg); roughly half of that comes from old catalytic converters, the rest from recycled electronic equipment and jewelry. The world's biggest reserves of platinum (roughly 63 million kg) are in South Africa's Bushveld Igneous Complex, notably in three mineral-bearing regions called the Merensky Reef, the Upper Group 2 Reef (UG2) Reef, and Platreef. Although figures vary from year to year, some 60–70 percent of the world's PGMs and platinum come from here. 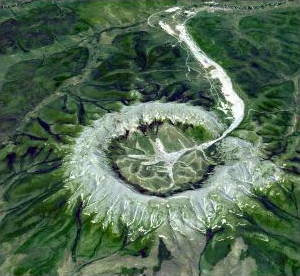 Photo: Mining at Stillwater County, Montana, source of most of the platinum mined in the United States. Photo by Russell Lee courtesy of US Library of Congress. If you take your spade to one of these platinum-rich deposits, you'll find the metal you're looking for mixed up with other valuable elements from the platinum group, other useful metals like gold, copper, and nickel, and less interesting stuff such as iron and sulfur. How, then, do you turn platinum-bearing ore into something you can wrap round your finger or use in a catalytic converter to clean the pollution from your car? The exact refining process depends on the components of the ore you're digging from the ground, and that obviously varies from place to place. In other words, somewhat different processes are used in different parts of the world. In South Africa, processing starts with a waste product of nickel and copper mining called nickel-copper matte. PGMs make up just 0.14 percent of the matte—roughly 1.4 kg in a tonne (or 50oz in a ton). The tiny amount of PGM is extracted with a combination of smelting (heat), electrolysis (passing an electric current through chemicals to separate them), and chemical purification (with acids). First, the ground matte is smelted in a blast furnace (similar to the ones used for making steel) to remove copper and sulfur, leaving behind a nickel matte and PGMs. The copper and nickel are turned, separately, into electrodes, which are purified through electrolysis. This turns them into pure copper or nickel blocks and a residue called anode slime, containing the PGMs. The slime is treated chemically through a complex, multi-stage process that separates it into its six useful PGM components: platinum, palladium, iridium, rhodium, ruthenium and osmium. Physically, platinum is heavy, soft, malleable (easy to work—only silver and gold are easier to shape), and ductile (easy to draw into wires) and has a fairly high melting point (~1770°C or 3220°F). Chemically, it's often described as a noble metal because it is so unreactive. It doesn't even react with oxygen in air so it doesn't rust or tarnish. It's also reasonably resistant to attack from acids. Photo: This low-temperature oxidation catalyst, made from tin oxide and platinum, can turn toxic carbon monoxide into harmless carbon dioxide. In future, devices like this could protect homeowners from fumes produced by poorly maintained heating appliances. 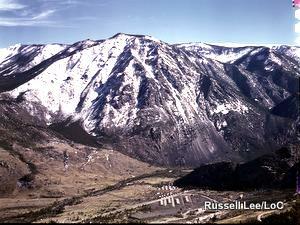 Photo by courtesy of NASA Langley Research Center (NASA-LaRC). If you know platinum at all, you probably know it as the "magic metal" that helps catalytic converters to strip out pollutants from car engine exhaust gases, but it's so expensive that other platinum group metals such as palladium are often used in its place. The ease with which platinum can be shaped and its inertness (chemical unreactivity) makes it particularly suitable for jewelry. Unreactivity also makes it useful in dental fillings, surgical tools, and apparatus for scientific laboratories. Apart from that, platinum finds important uses in the electrical industry, in lasers, and in making photographic materials. Artwork: The periodic table of the elements showing the position of platinum (element 78). Note that it's in the same group as nickel (Ni) and palladium (Pd) and its near neighbors include rhodium (Rh), ruthenium (Ru), iridium (Ir), and osmium (Os). 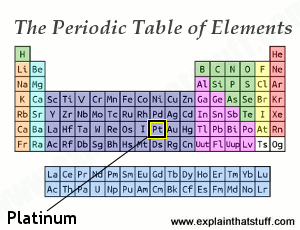 Gold (Au, element 79) is just to the right of platinum. Atomic number: 78 (one platinum atom contains 78 protons, 117 neutrons, and 78 electrons). Hardness: 4.3 (between fluorite and apatite on the Mohs hardness scale). US Geological Survey: Platinum-Group Metals: Useful statistics and summaries about world markets and trends (covers platinum, palladium, rhodium, ruthenium, osmium, and iridium). Currency Shocks Knock Platinum to 10-Year Lows: Reuters, 17 August 2018. Though demand for platinum remains strong, investors have turned their back on the metal. Atomic Tinkering With Platinum: Toward Affordable Fuel Cells by Dave Levitan. IEEE Spectrum, 27 Apr 2010. Scientists are trying to make platinum work more efficiently so a typical fuel cell needs 80 percent less of the expensive metal. Platinum prices 'set to rise 50%': BBC News, 19 May 2008. Why production problems in South Africa have pushed the price of platinum even higher. Who pays the price of platinum? by Angus Stickler. BBC News, 25 March 2008. A short introduction to the environmental and social impacts of platinum mining in South Africa. Sci/Tech Gold rush in space? by David Whitehouse. BBC News, 22 July 1999. One reason space scientists are so interested in asteroids is because of the hugely valuable minerals they contain, including gold and platinum. US Patent 4,188,362: Process for the treatment of platinum group metals and gold by Roderick Edwards et al, National Institute of Metallurgy, 12 February 1980. An alternative method of dissolving platinum group metals using aluminum. US Patent 2,662,861: Platinum and palladium catalysts by Earl W. Riblett et al, M.W. Kellogg Company, 15 December 1953. 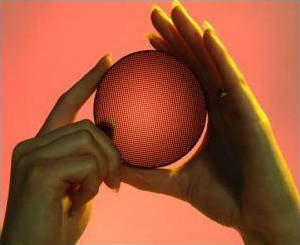 Describes a method of producing PMG catalysts. Platinum four hundred years ago: Platinum Metals Review, 1957, 1, (3). This old article from the archive gives us some of platinum's fascinating backstory. Extraction and refining of the platinum metals by A. Gouldsmith and B. Wilson. Platinum Metals Review, 1963, 7, (4). Another old article describes the process for extracting platinum in South Africa. Availability of the Platinum Metals: A survey of productive resources in relation to industrial uses by L. Hunt and F. Lever. Platinum Metals Review, 1969, 13, (4). Another look at platinum processing methods in South Africa. Platinum by Paula Johanson. Rosen, 2009. A basic 48-page introduction that introduces platinum, describes its properties, looks at platinum found in meteors and craters, and reviews the environmental and other uses. Platinum by Ian Wood. Benchmark/Marshall Cavendish, 2004. A slightly shorter (32-page) introduction that covers similar ground. Includes a good selection of photos and illustrations. These are more general introductions to atoms, chemical elements, and the periodic table. Atoms and Molecules by Chris Woodford and Martin Clowes. Blackbirch/Gale, 2004. One of my own books, this charts the history of how people came to understand that materials were built up from different kinds of atoms. How to split the atom by Hazel Richardson. OUP, 1999. Eyewitness: Chemistry by Ann Newmark. DK, 2005.